Not for the faint of heart this Battle Ready Medieval Sword by Legends In Steel is an absolute beast. It is a high carbon full-tang construction with a 34 in. blade. The grooved wooden grip gives you a secure grip when you wield it. It comes in at 42 in. overall. This is my first legends in steel sword. I ha a few shinwa a ten Ryu and several musashi swords. This is a beast. Its heavy. Just like all the post before the scales are to big. However, I dont think it's a big problem. They ARE wood so a rasp and an understanding of handle contouring will fix that. Definitely worth the money. I've broken a lot of BudK swords over the years, and learned what "battle ready" meant. Honestly, this sword is the nicest thing I've purchased from this dealer, and for a couple of reasons. First, it's actually thick steel all the way through the handle, unlike some rat-tail wall hangers. it is also WELDED to the crossguard ang pommel, from what I can tell, and the pommel is additionally peened in place. 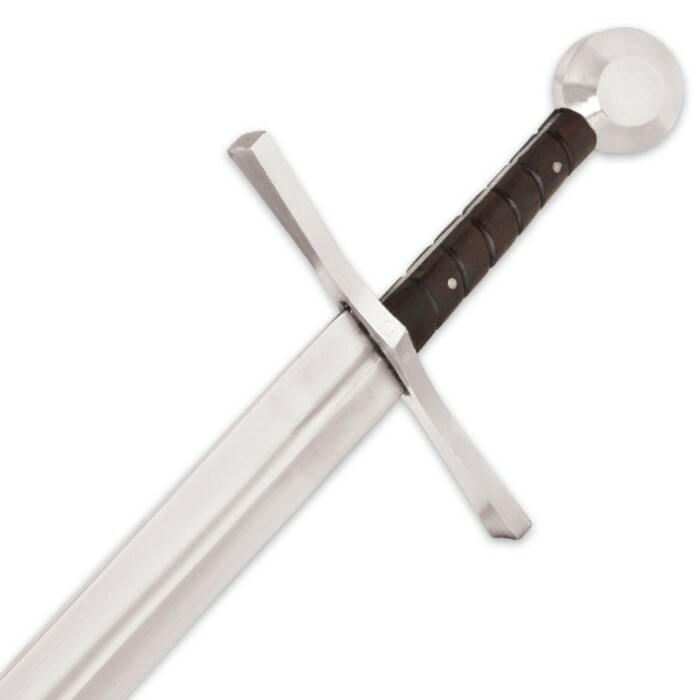 The entire sword feels like one solid piece, not a rattling typical $60. purchase. The only compaints are very minor, being that the handle scales are a bit wider than the steel tang, and feel unpleasant. Easily fixed by some elbow grease like sanding or filling the gap. The other being that the sword has a few blemishes on the pommel and guard, not rust, but slight imperfections. honestly, it loos like a blade ready to train with, and I like that. it's not a shiny perfect display piece, it's a broadsword! One other thing that other reviews have noted, is that this bade is not sharpened, though I would not call it "blunt". it comes unsharpened so that you can decide to put an edge on it if you want, or to leave it blunt as I will to wear for the renaissance festival or for practice. There is no sheath, but I'm planning to get one made for it from a craftsman at the ren fair. steel seems 3/16'th inch thick at the handle. and the blade is 1 and 5/8 inch wide most of the way, it really does not narrow at all. it really is a broad sword. and the blade measurements given by the site are true within an 8'th inch, I'd say. Edge is completely dulled, even chipped at one point. Shoddy craftsmanship, the blade flexes way too much and the grip is just awful. Definitely a $30 sword, it needs work to even be a display piece. I was disappointed that the sword is not sharp. It does feel sturdy though. This sword will make a nice wall decoration. 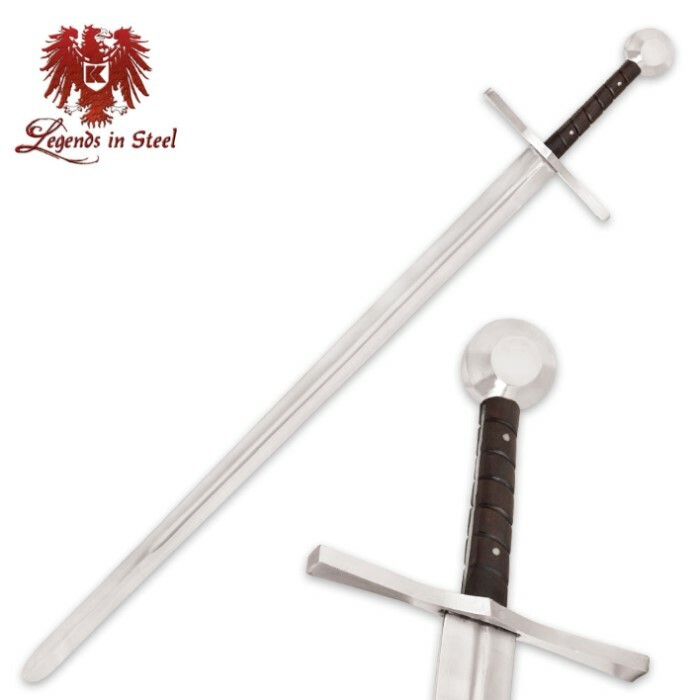 I was disappointed that it was not sharp as stated in the description .My invoice said sword with sheath but there is no sheath. For the most part I have liked all the products I have purchased from Bud K.